The laser has three characteristics: good monochrome, coherent and parallel. Therefore, it is particularly suitable for material processing. The traditional domestic tube cutting methods are mainly hand saw cutting, sawing machine cutting, roller extrusion, abrasive wheel cutting, and gas welding cutting, etc. These processing methods basically have the disadvantages of low cutting efficiency and high labor intensity, while laser cutting is widely used in the industrial field due to the advantages of faster processing efficiency and good processing effect. With the development of science, technology and industry, tube manufacturing parts have been widely used in industrial sectors such as aircraft manufacturing, engineering machinery, transportation, petrochemical, and farm and animal husbandry. In actual production, the tube has the advantages of low production cost, good formability, the light weight of structural parts and material saving, so tube cutting has an important position in the industrial field. As the shape, size and application of tube are different, and the cutting of the tube is subject to factors such as processing quality, it is crucial to select reasonable machining equipment, processing methods and technological measures. However, there are many inconveniences in tube cutting. Even if the traditional cutting methods can achieve the application effect, the processing efficiency is low and the processing efficiency is poor. Therefore, the combination of tube cutting and laser technology will make the tube cutting field have a broader development prospect. There are many advantages of tube cutting by lasers such as narrow incision width, small heat affected zone, fast cutting speed, good flexibility, smooth cut and no tool wear. With the emergence and development of CNC (Computerized Numerical Control) laser cutting machines, the development of various machining technique of space free-form surfaces and curves can show their unique side. 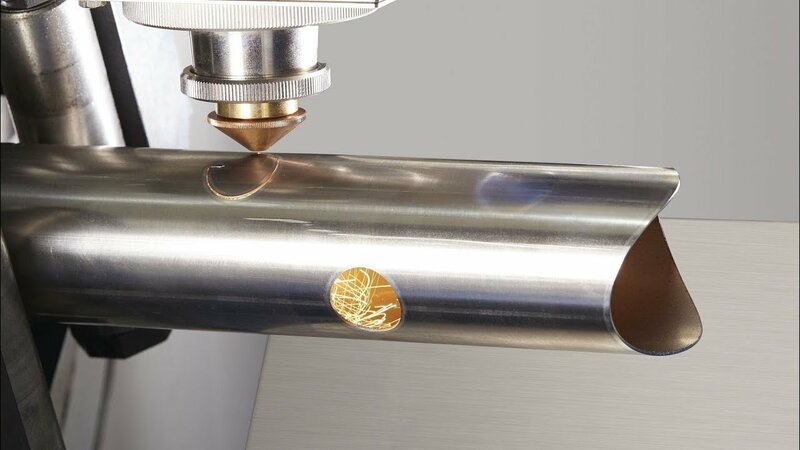 In laser cutting, not only the laser spot is required to move in 3d space relative to the workpiece according to a certain trajectory, but also the laser axis is required to be perpendicular to the machining surface of the pipe to be cut throughout the machining process. 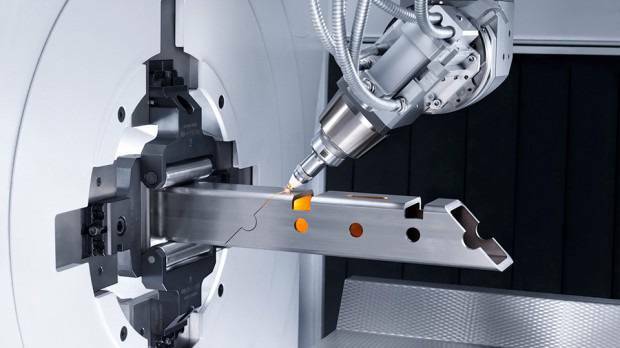 For CNC fiber laser cutting heads that can autofocus, the nozzles automatically track the surface of the workpiece through an automated measurement and control system. The production practice indicates that the key to tube cutting is to eliminate the defects of cutting quality to the greatest extent, so as to meet the processing requirements of the tube. For complex tube processing such as perforation, slotting, trimming or undercutting, laser cutting is not only faster than traditional machining methods but also ensures great processing quality. During the processing, the cutting of pipe parts should be ensured first to obtain the blank of the required length of pipe. The traditional tube cutting method is difficult to meet the needs of mass production, and the tube parts processed by these traditional processing methods have generally poor quality of the cut surface, and some even have processing defects such as deformation and collapse. 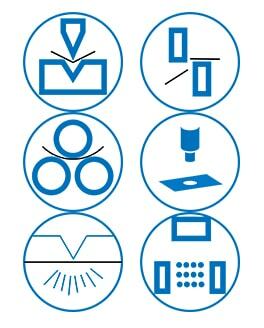 In addition to the need to cut the tube, some other forms of processing are required, such as pattern cutting for decoration and lamps, spiral, sine, cosine linear cutting, and marking, etc. If these forms of tube machining use traditional methods, not only the processing efficiency is low, but also it is difficult to achieve the ideal processing requirements, and some even can not be processed. The notch width is generally 0.1-0.3mm for tube cutting by laser (include straight-cut, beveling, and form cutting). The cutting position and temperature can be precisely controlled, which are more conducive to the automation and intelligent production. What’s more, compared with the traditional processing method, the cutting efficiency can be increased by 8 to 20 times, the processing cost can be reduced by 70% to 90%, and the material loss can be saved by 15% to 30%. Besides, the noise of laser cutting is low, and the impact on the environment is also slight. 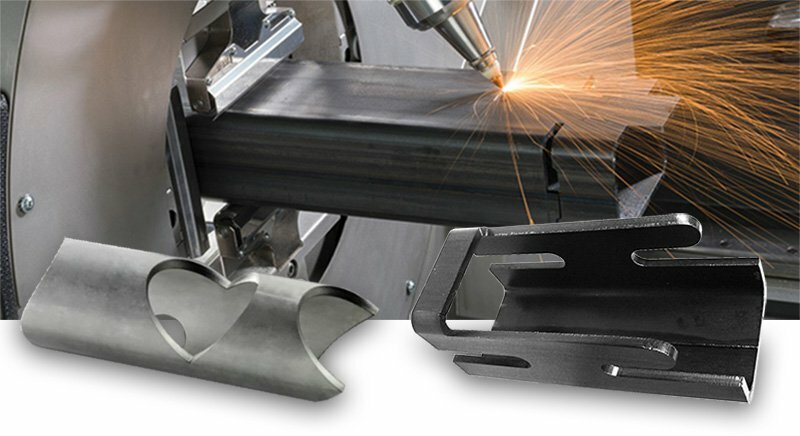 Conventional machining methods that require multiple sequential processes to complete the machining can be achieved by laser cutting on the same equipment. With the continuous improvement of equipment performance and processing technology, high-quality cutting of tubes can be achieved by laser. Laser cutting adopts non-contact processing method, which does not exert any pressure on the tube wall during the whole process, so it will not cause deformation or collapse of the outer surface of the pipe. At the same time, when cutting the tube by laser, the slotting thermal field is complicated, the cooling is difficult, and the cutting slag is easy to block, which increases the cutting difficulty. Therefore, it is necessary to strengthen the in-depth study of these aspects. Laser cutting has a great deal of freedom in the requirements of the material, shape, size and processing environment of the tube. Its spatial control (beam direction change, rotation, scanning, etc.) and time control (on, off, pulse interval) are excellent and easy to control. Moreover, the higher precision and fewer burrs of laser cutting greatly reduce the follow-up time spent in processing. When changing the diameter or shape of the tube, it is only necessary to modify the program, so the development of the tube cutting software is of great research value. The combination of laser cutting system and computer numerical control technology can form efficient automation equipment and open up a new path for high quality, high efficiency and low-cost processing. In order to improve the efficiency of tube cutting, the use of laser cutting automatic production line is the most effective production method. How to use the tube cutting automatic production line? First of all, the laser beam after focusing must be guaranteed to run synchronously with the tube which is for cutting by the automatic production line. Secondly, it is required that the laser spot after focusing can be rotated one circle relative to the tube to be cut, and the laser beam axis is always perpendicular to the pipe axis. During the cutting process, the laser beam of the pipe cutting production line moves together with the pipe being cut. During the cutting process, the laser beam of the tube cutting production line follows the tube to be cut. These synchronous movements must be controlled by a specialized control system, so the research on the automatic production line of tube laser cutting is also very significant. In a laser cutting device, the function of the light guiding system is to direct the beam output from the laser generator to the cutting head of the focusing light path. For tube laser cutting, if want to get high-quality cutting slit, the small diameter and high power of focus spot of focus beam are necessary. This allows the laser generator to perform low-order mode output. In the laser cutting of the tube, in order to obtain a relatively small beam focusing diameter, the laser must have a small transverse mode order time, preferably a fundamental mode. The cutting head of the laser cutting device is equipped with a focusing lens. After the laser beam is focused by the lens, a small focused spot can be obtained, so that high-quality tube cutting can be performed. In tube cutting, the tube to be processed belongs to a space curved surface, and the shape of the tube is relatively complicated. If it is programmed and machining by conventional methods, there will be certain difficulties. This requires the operator to select the correct machining path and the appropriate reference point according to the machining process requirements, and use the numerical control system to record the feed condition of each axis and the coordinate of the reference point, and then record the coordinates of the machining process and generate a machining program through the linear and circular interpolation functions of the laser cutting system. Therefore, studying the automatic vertical function of the laser beam and cutting tube is also one of the important technical contents of tube laser cutting. In order to ensure the cutting quality of the laser-cut tube, keep the focus on the vertical direction of the workpiece surface by means of automatic measuring and control devices is the key to tube laser cutting. At present, we integrate the laser focus position with the direct axis(X-Y-Z) of the laser processing system, which makes the movement of the laser cutting head more light and flexible, and the position of the focus can be well understood, so as to avoid the collision of the cutting head with cutting pipe or other objects during the processing. Tube laser cutting is becoming more and more widely used in today’s industrial society, and the tube to be cut are more and more diversified. Besides, the tube parts themselves have their own complexity. Therefore, according to the material, shape and processing requirements of cutting pipe, choosing appropriate laser cutting process parameters to obtain the best cutting efficiency and cutting quality has become the most concerned issue for all users of laser cutting system. For a continuous wave output laser generator, the laser power has an important effect on laser cutting. In theory, the greater the laser power, the faster the cutting speed. But considering the features of the pipe itself, the maximum cutting power is not the best choice. When the cutting power is increased, the mode of the laser itself changes, which affects the focus of the laser beam. In practical processing, we often choose to get the highest power density in the case of less than the maximum power, so as to guarantee the efficiency and cutting quality of the whole laser cutting. speed is within a certain range in order to obtain better cutting quality. If the cutting speed is slow, excessive heat will accumulate on the surface of the tube, and the heat-affected zone will become larger, and then the slit will become wider. Besides, The surface of the incision is cauterized by the discharged hot melt material, which makes the surface of the cut rough. When the cutting speed is increased, the average circumferential slit width of the tube becomes smaller. The smaller the diameter of the pipe, the more obvious the effect. 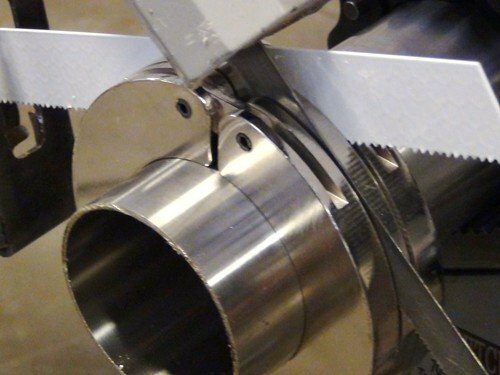 With the acceleration of cutting speed, the time of laser action is shortened, the total energy absorbed by the pipe becomes less, the temperature at the front end of the pipe decreases, and the width of the slit turns smaller. If the cutting speed is too fast, the pipe will not be cut through or cut off, which will affect the whole cutting quality. When cutting the tube by laser, the characteristics of the tube itself can have a great influence on the processing. For example, the size of the tube diameter has a significant impact on the processing quality. Through the research on laser-cut thin wall seamless steel pipe, it is found that the tube diameter and the slit width will continue to increase while the various process parameters remain unchanged. When cutting nonmetal and part of metal tubes, compressed air or the inert gas such as nitrogen can be used as an auxiliary gas. However, for most metal tubes, the active gas such as oxygen can be used. After determining the type of auxiliary gas, it is also important to determine the pressure of the auxiliary gas. When cutting a tube with a small wall thickness at a relatively high speed, the pressure of the auxiliary gas should be increased to prevent the adhering slag from being caught in the slit; When the thickness of the cutting pipe wall is large or the cutting speed is slow, the pressure of the auxiliary gas should be appropriately reduced to prevent the tube from being not cut through or not cut off. The position of the beam focus is also vital for tube laser cutting. During cutting, the focus position is generally at the surface position of cutting pipe fitting. When the focus is in a good position, the slit is the smallest, the cutting efficiency is the highest, and the cutting effect is also the best. In most cases, the focus of the beam is adjusted below the nozzle and the distance between the nozzle and the surface of the tube is approximately 1.5 mm. At the same time, factors such as laser pulse-shape and light output mode also have a certain influence on the cutting effect. Tube laser cutting is inseparable from the hardware – laser cutting system (including laser generators) and software – laser cutting technology. 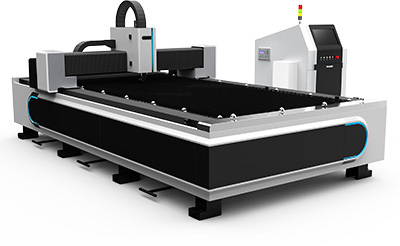 From the hardware point of view, the future laser cutting machine will develop in the direction of high speed, high precision, high automation, flexibility and diversification; from the software point of view, the future laser cutting will be combined with CNC technology to develop new software. Therefore, the collection and finishing of laser cutting process data, the establishment and improvement of expert systems, are of great significance and research value for the development of the entire laser cutting industry.